Curb Appeal Begins on the Roof! Most home sellers accept an ugly stained roof as part of their home’s décor. However, most home buyers see the address as just another house with an ugly roof. The buyer's experience begins before he/she enters the seller's front door. Because most sellers live with their ugly roof stains, they have grown accustom to seeing them everyday. The horrific roof stains have become a part of the home’s décor, so the seller simply accepts them or ignores them. ​The problem is, when a potential buyer sees the house for the first time, he/she will in all probability view the house as dirty, unattractive, unhealthy and neglected. Picture the following: The seller runs the sprinkler system constantly in the wee hours of the morning and throughout the day, with the hope of maintaining a lush green lawn. The lawn is beautiful. The exterior trim is freshly painted. And if that's not enough, behold a tall For Sale sign is proudly placed in the lush green lawn, with the caption, I’m Gorgeous Inside! on the seller and poured black paint on the roof. The buyer turns to the realtor and asks, What is that ugly black stuff on the roof? It simply has not occurred to many VA Beach, Chesapeake, Suffolk, Hampton Roads, Williamsburg and Northern VA Real Estate Agents and sellers that the horrific unattractive algae, mold, moss and lichen infestation on the roofs can instantly turn serious buyers off. he/she may still be preoccupied with either What’s wrong with this house or This roof will be expensive to replace. Ever hear the phrase, a great first impression increases sales? Well guess what, it’s true! ​the ugly stained roof. Before the For Sale sign goes up, call RoofGlo™. We can restore your property's curb appeal without destroying the remaining life of your roof shingles. No part of this document may be reproduced. Copyright © 2004 - 2019 RoofGlo™ All rights reserved. 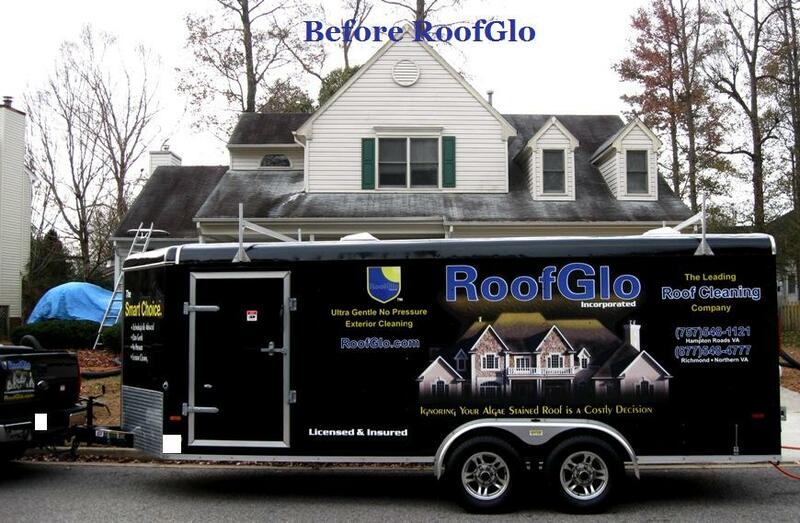 ​​All testimonials written by RoofGlo™ customers. *5 year warranty is based on the condition of the roof shingles.